In this project, you will learn to make stick puppets and simple shadow puppets. These puppets can be used for creative make-believe or with a scripted play. 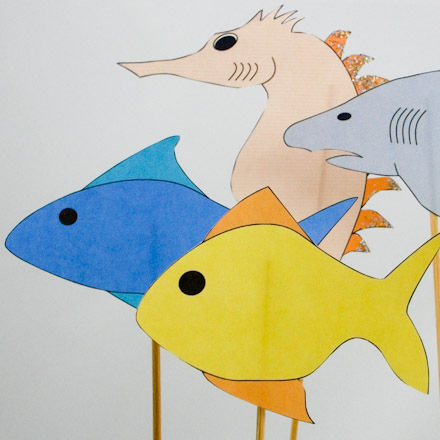 Once you have made the puppets in this project, you will be able to design and make your own stick puppets. This is the first in a series of puppet projects that includes plays based on fables from around the world. A fable from the Fiji Islands is the basis for a play, The Great Shark God, using the puppets in this project. 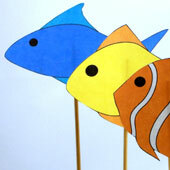 Related craft: For a quick and versatile way to make stick puppets, try the Clip Art or Photo Puppets project. Kennedy Center: Tangshan Shadow Puppet Theatre: Watch a video of a beautiful Chinese puppet show as performed by the Tangshan Shadow Puppet Theatre. Choose the puppets that you want to make. You can choose to make stick puppets or shadow puppets. The fish patterns are easier to cut than the seahorse, shark and octopus patterns. 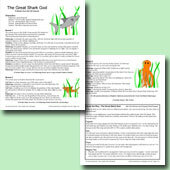 For additional shadow puppet patterns, see Shadow Stick Puppet Patterns. Download and print the pattern. You can print the pattern on white or colored paper. Make a stiffer puppet by printing on cardstock. You'll notice that the patterns include right- and left-facing versions of each puppet (except the octopus). Either make separate right and left puppets, or make two-sided puppets. If you chose to print the black and white pattern, color the puppets any way you like with crayons, markers or colored pencils. You might also decorate the puppets with glitter or bits of colored paper, but you may want to wait to decorate the puppet with glitter until after you have cut it out. Skip this step for shadow puppets. Cut out each puppet, taking care to stay close to the line around the puppet. If you printed on paper, a stronger puppet can be made by gluing the cutout to cardboard or cardstock. First do a rough cut, and then glue the puppet to a piece of cardboard. After the glue dries, finish cutting the puppet. The octopus puppet has two parts. Cut out both parts and glue the second set of four legs to the body as shown on the pattern sheet. Put the puppet right-side-down on the table. Position the skewer with the point up near the center of the puppet. Cut one or two 1" (2 cm) lengths of tape. Tape the skewer to the puppet. Two-sided puppets: Attach the stick to the back of the right-facing puppet, then glue the left and right puppets back-to-back, covering the tape and stick. Bamboo skewers are available in most grocery stores. Pick ones that are 10 or more inches (25 cm) long. Any other flat or narrow stick will also work. In a pinch, you could use popsicle sticks taped together to make a 10" stick. To put on a show, you will also need a stage. Turn a card table on its side, or put two chairs together and hang a towel or sheet from a stick across the chair backs. You will also want some scenery for the fish. 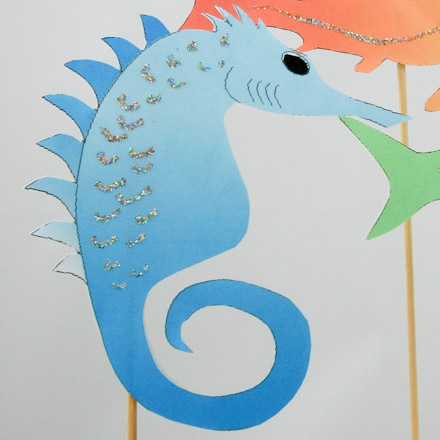 Take a large piece of blue or green construction paper, and decorate it with seaweed and other water plants. Hang this on the wall behind your stage. Perform the play The Great Shark God, or make up a story of you own. Think of what your puppets will do. Does your play take place in the sea or an aquarium? Your play could be funny or dramatic. For a funny play have the fish tell jokes. The shark chasing the fish will make a more dramatic play. Rehearse your play a few times, and then perform it for family and friends. Tip: Make sound effects for your watery stage by blowing on a straw in a cup of water. 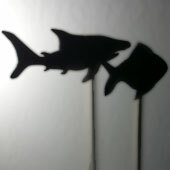 Shadow puppets: Stick puppets can also be used as shadow puppets. Hang a piece of tissue paper or a thin sheet as a drape. Put a bright light behind the drape with the puppets between the light and drape. The audience will see shadows moving across the stage. Be sure the light doesn't shine on the puppeteers—we don't want to see their shadows. 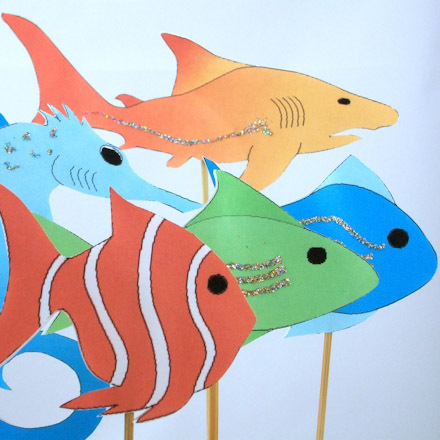 Puppet Play: A fable from the Fiji Islands is presented in the play, The Great Shark God, accompanying these puppets. Tip: Aquatic life often looks shiny or reflective! Use a little glitter to add some shine to your puppets. 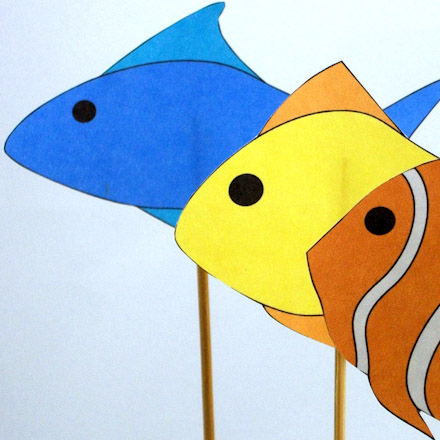 Tip: For a school of fish, fan out three fish puppets and hold them all in one hand. 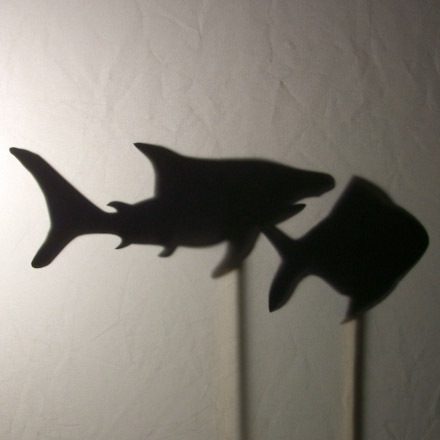 Tip: Most stick puppets can be used as shadow puppets, too. Tip: Make a colorful set of stick puppets and add a bit glitter. 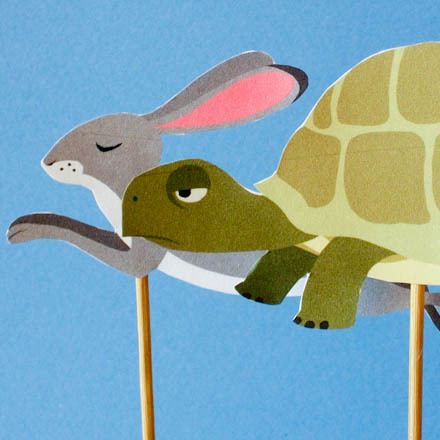 Tip: Make stick puppets for the retelling of fables, like the Tortoise and the Hare. 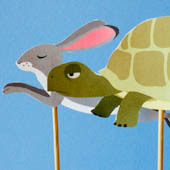 See how to make these puppets in the Clip Art or Photo Puppets project.